Figure 32.1 Mass balance observations on the Peyto Glacier, AB, 1966-1995, adapted from Demuth & Keller (1997). Winter balance is the net accumulation of snow during the autumn, winter and spring seasons and summer balance is the total amount of summer mass loss due to surface melt. Net annual balance is the sum of the winter and summer balance. All variables are averaged over the area of the glacier and are expressed in metres of water equivalent. Dashed lines indicate the 30-yr means. No data were collected in 1990-91 and 1991-92.
well for these ice masses, because the impact of (for instance) a 1°C warming or cooling or a 20% change in precipitation can be translated directly into glacier-wide mass balance impacts (e.g. Fleming et al., 1997). Long-term simulations at a given local study site need to consider the feed-backs associated with changing glacier elevations. Glacier hypsometry (the area-elevation distribution) dictates how responsive the glacier-wide mass balance is to sustained climate perturbations (Furbish & Andrews, 1984). In a climate-warming scenario, for instance, a 0.5°C warming may correspond to a 200-m increase in the snowline at a particular site. Low-sloping ice masses will be heavily influenced in this situation, as an increase in snowline (the elevation at which ablation is equal to accumulation) will result in a larger area of the glacier surface that is converted to the ablation zone and is now subject to net annual mass loss. Cumulative long-term mass-balance changes therefore depend on an individual glacier's hypsometry, which is controlled by bedrock topography, ice thickness, ice rheology and ice dynamical regime. 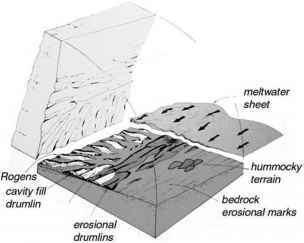 Cold, stiff ice that is frozen to the bed, for instance, tends to have a steeper profile than ice that experiences significant basal flow. Schneeberger et al. (2001) simulated the response of Storglacia-ren, Sweden to 2 x CO2 climate-change forecasts derived from high-resolution AGCM simulations. A doubling of CO2 is expected by close to 2050, so these simulations represent ca. 50-yr forecasts of glacier length, area and volume response to potential climate change. Schneeberger et al. have extended these simulations to 50-yr forecast scenarios for several well-studied glaciers in Europe, Asia and North America, and these are among the most definitive modelling studies to date of individual glacier response to climate change.